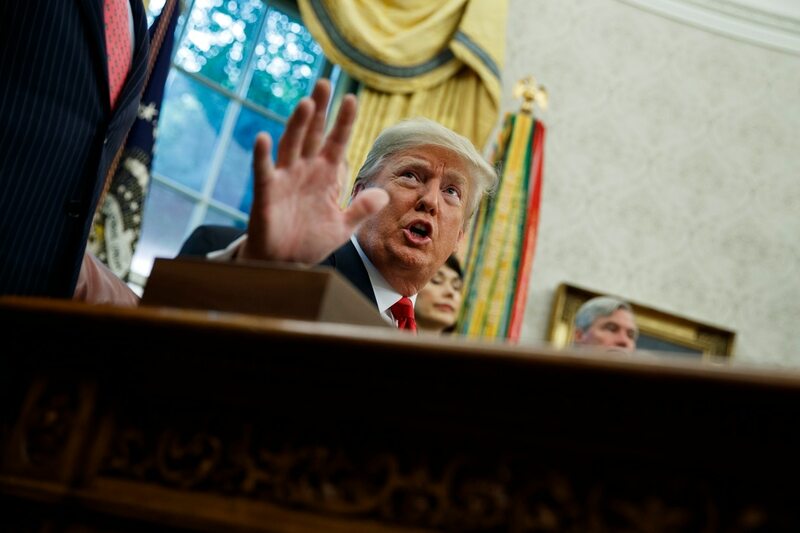 WASHINGTON — U.S. President Donald Trump signaled for the second time in 24 hours he would oppose stopping arms sales to Saudi Arabia even if its government was found to have murdered a Saudi journalist. Trump said Thursday morning he wants answers amid reports the Saudi government is to blame in the disappearance of Jamal Khashoggi, an outspoken critic of the Saudi government and its de facto leader, Crown Prince Mohammed bin Salman. But Trump said he wants to avoid a move that would send Riyadh to the U.S. defense industry’s competitors overseas. “We don’t like it, not even a little bit. But whether or not we should stop $110 billion in this country knowing [Saudi Arabia has] four or five alternatives — two good alternatives? That would not be acceptable to me,” Trump said. Thursday on Capitol Hill, lawmakers were discussing various tracks to punish Saudi Arabia if the allegations were founded ― by suspending arms sales, by cutting U.S. military aid to the Saudi-led campaign in Yemen or by imposing sanctions — though some lawmakers expressed doubts Trump would follow through. Wary of disrupting ties with a longtime ally, or perhaps hemming in the president, Republicans mostly urged restraint. The Senate’s No. 2 Republican, John Cornyn, R-Texas, said he would reserve judgement until the facts emerge. “This is obviously a very serious matter, and our relationship with Saudi Arabia is important," he said. During an impromptu Oval Office press conference, Trump panned the idea of curbing arms sales. Doing that would derail the $110 billion package of proposed weapons sales to Riyadh that Trump announced on his first trip abroad as president. “I would not be in favor stopping of a country spending $110 billion [in the U.S.], which is an all-time record, and letting Russia have that money, and letting China have that money,” Trump said. “Because all [Riyadh’s] going to do is say, that’s OK, we don’t have to buy it from Boeing, we don’t have to buy it from Lockheed, we don’t have to buy it from Raytheon and all these great companies. We can buy it from Russia and China." “So what good does that do us? There are other things we can do,” Trump said. Trump said the U.S. is looking into Khashoggi’s disappearance, but seemed to downplay its significance. “Again, this took place in Turkey. And to the best of our knowledge, Khashoggi is not a United States citizen,” he said. To some degree, the arms sales issue is already moot because the Senate Foreign Relations Committee’s ranking member, Sen. Bob Menendez, D-N.J., has been holding up U.S. sales to Saudi Arabia for months under the Senate’s informal review process over questions about civilian casualties caused by the Saudi-led coalition in Yemen. Corker and Menendez acknowledged Thursday that arms sales to Saudi Arabia were already effectively frozen and will not advance while the Khashoggi matter is unresolved. Separately, Sen. Chris Murphy, D-Conn., and Sen. Rand Paul, R-Ky., have vowed to force a votes on any Saudi arms sale the administration advances. Murphy has said the Khashoggi matter makes the case against U.S. military aid to the Saudi-led campaign in Yemen, which includes aerial refueling of Saudi aircraft. Paul plans to introduce a measure to cut all funding, training, advising, and any other coordination with the Saudi military until Khashoggi is returned alive. Sen. Bernie Sanders, I-Vt., and a potential 2020 presidential candidate, said he plans to reintroduce a resolution invoking Congress’ war powers to end U.S. involvement in the Yemen civil war. Sen. Lindsey Graham — a confidante of the president’s and chairman of the Senate Appropriations subcommittee on state, foreign operations, and related programs — said he favors sanctioning Saudi government officials if they’re involved, but not ending military cooperation in Yemen. Sanctions seemed to have the most momentum as a next step. Corker and Menendez on Wednesday led 18 other senators (including Graham) to ask Trump to impose sanctions against anyone found responsible for Khashoggi’s disappearance, even if that includes the leaders of Saudi Arabia. They triggered the Global Magnitsky Act, which gives the president 120 days to decide whether to impose sanctions on any foreign person he determines sponsored or was involved with the journalist’s disappearance. “If it turns out to be today what we think it is today, but don’t know, there will have to be significant sanctions placed at the highest levels,” Corker said. Corker said that while there is a tight relationship between Trump and bin Salman, and Corker views bin Salman as an intellect and a visionary, the U.S. must seize the opportunity to send bin Salman a sharp message and do it now. Menendez said similarly the sanctions must go as high as the evidence shows and that the U.S. must not sell out its values to maintain the status quo, even if it benefits the U.S. in other ways. “It’s important to send a global message that this is not permitted,” Menendez said, adding: “Unless [Saudi Arabia] understands that you can’t have carte blanche and you have to be held to international standards, it may continue down that path."